It happens, that magical burst of writer energy. Excited fingers tapping out sentence after sentence, paragraph after paragraph. Pages piling up (not literally, but you know what I mean). I sit back. Exhale deeply, a shot of wonder pumping through my writer being, and I’m convinced every word was perfection. Then I read back over what I have written, and my mood fades with the same sudden mystery of its onset. Oh, no, it’s that thing I hate, the bigger part of my brain (I’m being generous) that screams rule worshipping acquiescence over creative risk taking. It seemed such a great idea at the time. And yes, I did it again. I wrote myself into that … that writers’ corner: the one that requires more, not less from me. I turn rational, logical, backing out, backing down. It’s as simple as the delete key. Oh, but it felt too good to be wrong. Maybe I’ll do the half-assed thing I think of as writer compromise. Disagreeing dog moves off her bed, stares up at me, a bigger frown on her seriously wrinkled mug. 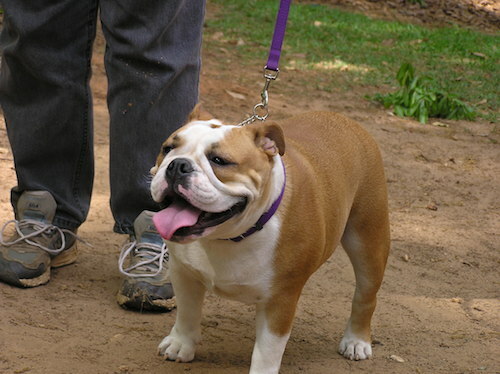 She consents to the collar and trudges bulldog slow toward the door, her grumbling audible in her deep grunts. We take the forbidden path across the manicured golf course. Old guys in brightly colored pants look up and point toward the no trespassing sign. Their collective outrage passed back and forth. Then our business here is of a serious nature, so I shrug and we walk on. Dog sits. Sighs deeply and stares at the ground. I watch as a fat man pounds the ground with what I expect is an expensive club, his ball, that’s his golf ball, having dinged of a tree and plopped into a puddle-size pond of green water. I think I must get this writer’s happy look, because Sass gets onto her all-fours. “Okay, by God, I’ll write it, but I’ll be yelling, ‘No, no, don’t do that. It’s certain to lead to shame, misery, heartbreak, and danger.’ Some of my favorite emotions—to write about, I mean. Dog turns back toward home. Her bed has barely cooled. This entry was posted in Animals on February 23, 2014 by Brad Kuhn.